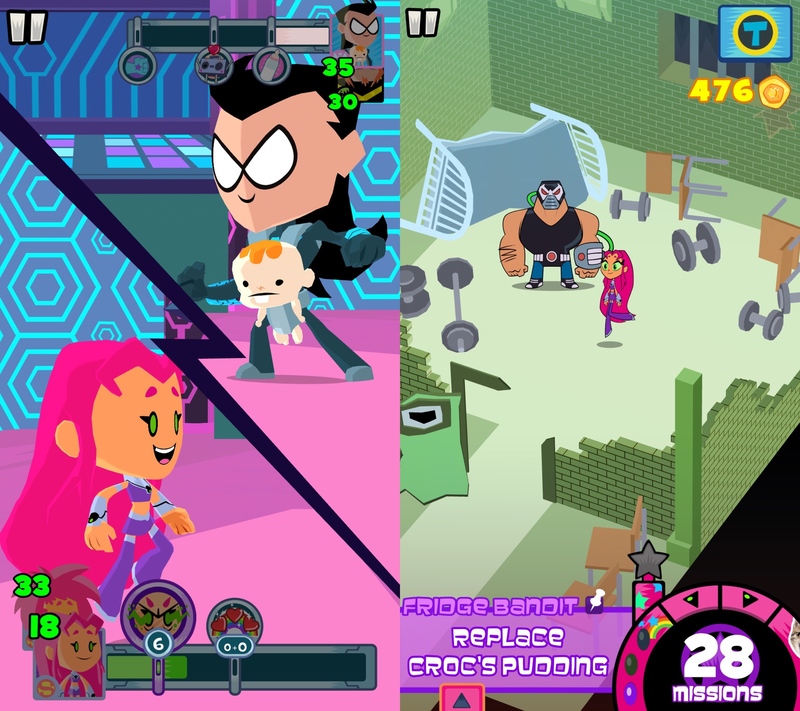 When I reviewed Teeny Titans ($3.99) back in the summer of 2016, I didn’t exactly hide my enthusiasm for the game. It was a rare case of an RPG that not only didn’t overstay its welcome, but actually left you wanting for more. In that review, I rather strongly pined for updates or a sequel. Now, with the release of Teen Titans GO Figure ($3.99), I’ve received both. Following on the big update to Teeny Titans that added some prominant non-Titans DC characters to the mix, this sequel pulls in the wider DC Universe right from the start. You’ll be visiting Metropolis and Gotham, picking up figures of Catwoman and Clark Kent, and battling against the likes of Lois Lane and Carmine Falcone. 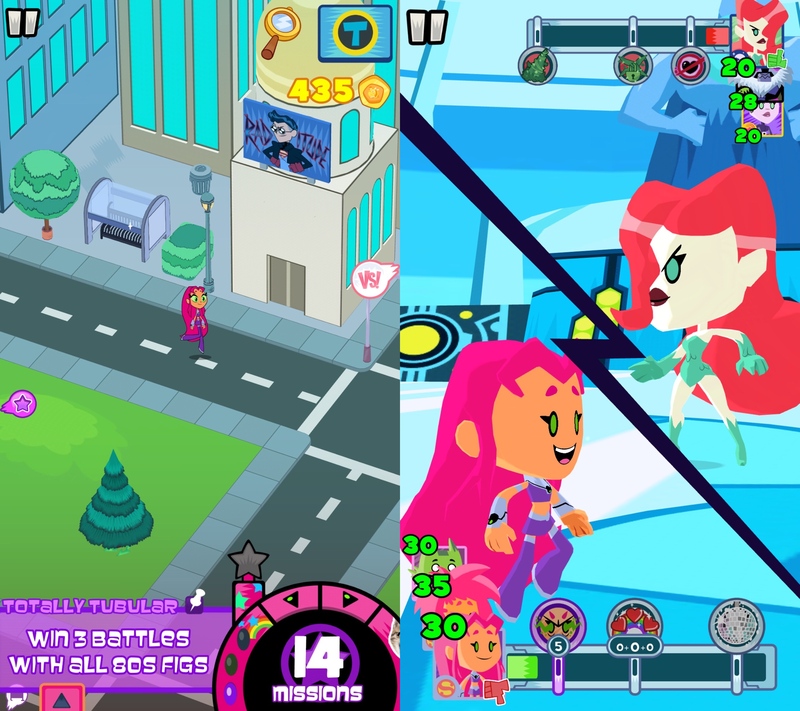 Apart from the new places and faces, though, Teen Titans GO Figure is an awful lot like the original game. This time, you’ll start the game by choosing the Titan you want to play as, so you don’t have to be Robin if you don’t want to. It’s been a couple of years since the height of Teeny Titans-mania, and the company that makes them is discontinuing the toys. One last batch is going out to stores, and just like that, the Titans are sucked into the collectathon all over again. You’ll be going along with them, naturally. That involves buying, searching out, or winning more than 100 figures, as well as participating in (and winning) a number of tournaments that are held around the three cities. Not too far into the game, you’re given the reason why the toys are being discontinued, which gives the Titans an excuse to leave Jump City for one of DC’s more popular locales. Your choice of playable Titan doesn’t have any effect on the gameplay, but you will get a lot of customized dialogue based on your choice. Regardless of your pick, you’ll be experiencing largely the same stories and missions, but the different ways each Titan interacts with the game’s many NPCs can be a lot of fun to check out. And you will be doing a lot of interacting with NPCs. You’ll always have a main story mission in play, but you’re probably going to hit a wall if you try to proceed directly towards finishing those missions. To survive the mandatory battles that come during the story, you’re going to need to power up. There are lots of ways to do that. You can acquire new figures that are more powerful than your current ones. They can be bought at the many shops found across the cities, and you’ll occasionally earn them as prizes from completing side-missions or random rewards from tapping shiny spots found around each map. Of course, buying figures is going to require coins, and a lot of them. You’ll find coins scattered around the map, and they regularly replenish themselves, but if you want to make real money, you’ll need to either solve side-missions or engage in battles. Some side-missions involve searching out objects on the map or handing in particular figures, while others will force you to battle, typically under special conditions. You’ll also want to level your figures up, which can only be done through battling. Most of the side-mission battles will be way beyond your capabilities near the start of the game, so you’re going to have to farm that experience off of random NPCs. Nearly everyone you can talk to in the game can be battled, and if saving the day means picking on some kids with cheap figures, so be it. Each level up will either unlock a new ability or give you the chance to pick a stat to increase. Only the three figures who join the battle will earn experience, so if you want to cover your bases for special challenges, you can expect to do a fair bit of grinding. You can also fit your figures with custom chips that convey various benefits. A figure can only hold a single chip at a time, and removing the chip will destroy it. Losing chips isn’t the end of the world in most cases, so you’re free to re-spec this aspect so long as you don’t mind wasting coins. Figures can also be enhanced by feeding them other figures, with similar figures offering a greater boost. Successful enhancement increases the strength of your abilities, and is essential for surviving some of the tougher battles. So far, this is probably sounding very familiar to those who played the first game. And indeed, Teen Titans GO Figure is almost entirely similar to the original in terms of its nuts and bolts. Map exploration is similar, battles work in the same way as the first, and a considerable number of the figures are hold-overs from the previous game. Many of the visuals, animations, music, and other audio make the jump as well. There’s a lot of new content here thanks to the new cities and the redesigned layout of the original map, and there have been considerable changes to abilities and characters to make combat more balanced and challenging. At the same time, however, it doesn’t take long for a sense of deja vu to kick in. I’m having trouble deciding how much of an issue that is for me. I loved the original game to pieces, but I’m not sure the pieces I loved were the grinding, scavenger-hunting, and fetch-questing. I feel like more thought has been put into the combat challenges, forcing you to use a variety of figures instead of just relying on one strong team, but the cost of that is that you’re going to need to keep quite a few figures in good fighting shape. The new figures are great, but I’d be lying if I said the game offered the same thrill of the hunt when most of the game involves reassembling a collection I already worked hard to complete before. Reassembling it in largely the same way, no less. Grind up coins, hit the shops, shuffle around for the ones you don’t already have, then head back out and get more coins. There are a few other new things that I should mention. First, let’s address the IAPs, since the first game didn’t have them and I know some of our readers may be concerned about their presence here. There are a few ways you can spend real money in Teen Titans GO Figure, but none of them are required in any sense. First, there are Riddler Eggs. Pop open one of these to get a random grab-bag of goodies including figures, coins, chips, and accessories. You’ll get the first one free so that you can see what they’re all about, but after that you’ll have to buy them if you want them. Everything found in them can be found elsewhere, of course. Next, there are Repaint Tokens. These can be exchanged with a special NPC to repaint your figures in several pre-set color patterns. It’s purely cosmetic, and Repaint Tokens are available in abundance without having to buy them. Finally, there are rare figures. 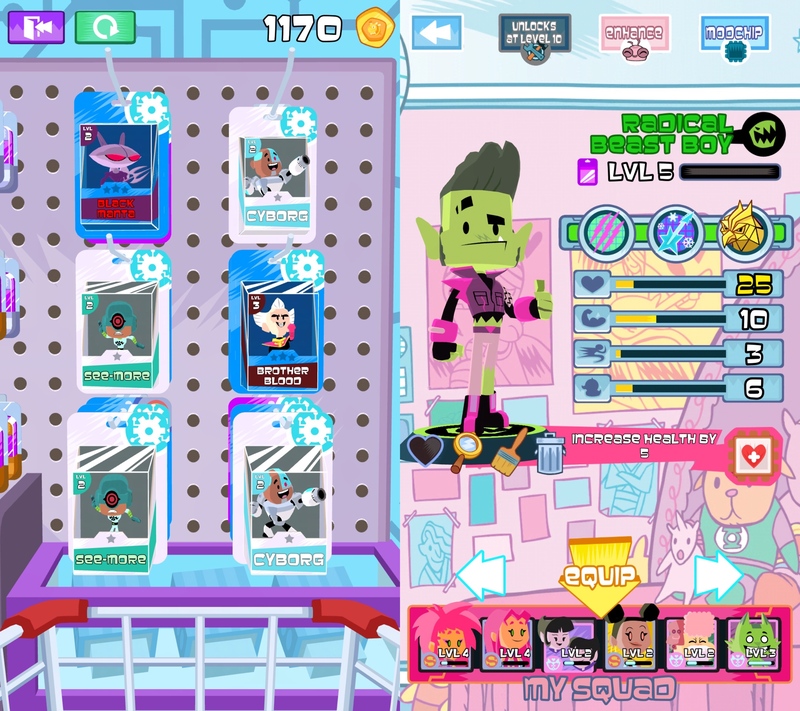 This rotating selection gives you the chance to outright buy some of the more difficult-to-find or expensive figures in the game. Again, every character you’ll find here is available elsewhere in the game. This just gives you the chance to buy them if you don’t feel like earning them in-game. Some of these rare figures command an absurd price in the game’s stores, but that was also the case in the original game so I’m not calling foul here. All three of these IAPs are accessed by visiting the Riddler’s Shop, and you can disable the IAPs if you don’t want the temptation. Another new addition, and probably the biggest change mechanically speaking, is the presence of accessories. These are special items that you can bring into battle. You’ll have to charge them up by collecting batteries and performing attacks, but once they’re ready to go they will produce a variety of helpful effects. You can only bring one with you at a time, adding another strategic layer to a battle system that already offered quite a bit of depth beyond its simple presentation. It’s also one more thing to collect. There’s some great fan service with these accessories. The first one you’re likely to get is an actual Green Lantern, and you’ll come across the Bat-Signal and even Superman’s underoos before all is said and done. Accessories aren’t an obvious game changer, but I can appreciate the challenge that the developers had in trying to freshen up a battle system that already worked so well without accidentally destroying it. 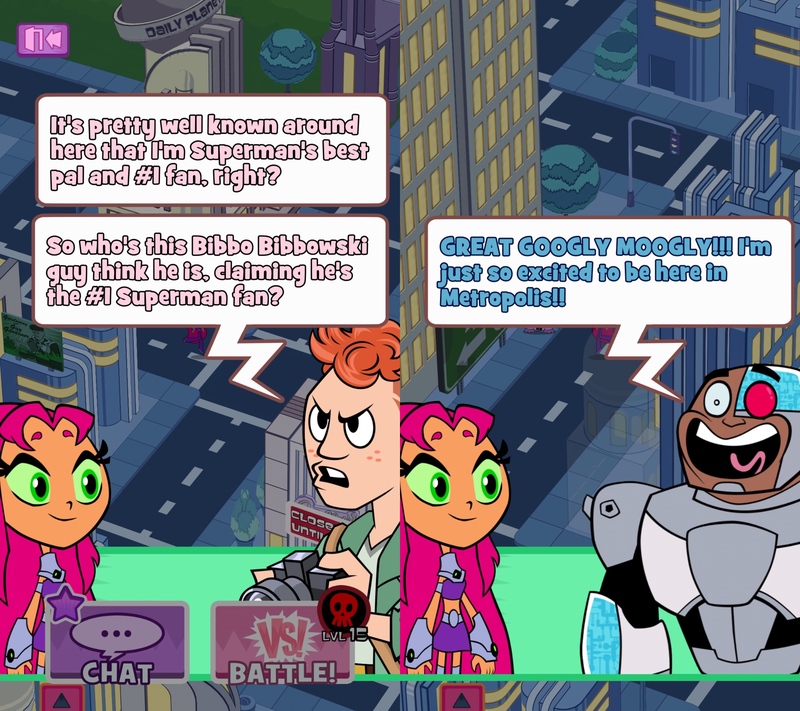 Speaking of fan service, this game is packed to the absolute brim with DC references. Some of them are extremely cheeky, like a side-mission that tasks you with hunting down a bunch of people named Martha. The intense rivalry between Jimmy Olson and Bibbo Bibbowski over who is Superman’s real best pal is hilarious. Every signboard, every bit of graffiti, every stray detail is a chance for developer Grumpyface to insert a joke or reference, and you’ll almost never be disappointed for looking at just about everything in the game and talking to everyone. Perhaps more than anything else, it was this new batch of entertaining dialogue, humor, and background detail that had me pressing forward through the game. I’m glad the developer was given a bigger sandbox to play around in this time. They seem to have had a lot of fun with it. I’m less thrilled with the progression curve in this game. You have a lot of freedom almost immediately, which is not necessarily a bad thing. But you’ll soon start piling up side-missions that you’re not going to be able to clear for a very long time, and the difficulty of the story missions ramps up fairly early in the game. After scouring Jump City, Metropolis, and Gotham along with the sub-locations that branch out from them, you’ll likely have more than 20 side-missions in your backlog, many of which will require you to have a relatively strong party assembled. So what can you do? There’s nothing for it but to grind. Grind experience, grind coins, power up in the most dull possible ways. Once you get over the initial hump things smooth out dramatically, though there are still some extra-tough challenges to be found for those who go looking. I don’t want to pick on the increased difficulty too much, though, since the general ease of the first game pre-update was an issue for some. This is a harder game to be sure, and in many regards it is for the better. Some of the old reliable tricks aren’t quite so reliable anymore thanks to how things have been rebalanced, and enemies have a bit more bite to back their bark. It’s mostly in the game’s opening hours where things are a bit messy. There’s still plenty of grinding to done throughout the whole game if you want to collect every figure, but I reckon most people with that mentality know what they’re signing up for. Nothing is forcing you to seek out all of the figures, and the game’s proper story certainly doesn’t require it. But if you do want to do it, be ready for things to get a little silly in places. And I don’t mean ha-ha silly. If I sound like I’m waffling back and forth on this game, it’s because I am. In a vacuum, it is unquestionably an awesome game, one that is worth your time and money. It’s Teeny Titans but more of it. But it resembles the first game in more ways than not, and unlike in the case of, say, Battleheart 2, it really hasn’t been that long since the original came out. As a result, the parts of the game that are functionally almost the same as before sometimes feel like work. There’s a reason each new generation of Pokemon introduces a mostly-new assortment and allows you to carry over your old collection if you wish, and it’s because collecting the same things you already collected before isn’t nearly as much fun. The new figures and wider scope of the adventure are all great things, but this still feels close enough to Teeny Titans that it’s almost wearisome at times. Let’s bring this to a close, then. Did you play Teeny Titans? If not, then go ahead and get Teen Titans GO Figure. It’s great, and you’ll have an amazing time with it. If you did play the first game, how excited do you think you would be to replay it? If you would be fine with that, again, full steam ahead here. Enjoy yourself. But if you can’t see yourself replaying the first game right now, you’ll want to really ask yourself if you have the desire to play a sequel that has you doing a lot of the same things all over again. Of course, if you’re a big fan of the Teen Titans or the DC Universe in general, this is all moot. The bulk of the game’s new content is found in how it mucks about in that particular brand, after all. Grab the game, you’ll love it. The game may be spinning its wheels, but hey, there are worse wheels to spin.